Baby Bolero . . .
We have been impressed with the consistent quality of Bliss’ relatives, not only in the Little Orchard herd itself, but also the influences exhibited in other herds throughout the U.S., past & present. Bliss is figuring heavily into our breeding program, as we feel she “has what it takes” all the way around. She shows well, she’s appraised well, she milks well, she’s proven her adeptness at producing terrific offspring - & also representative of the longevity we believe is an imperative trait to instill, looking fantastic as an aged doe. We are very pleased with the “Bliss Family” contained within our own herd & also with the offspring Jrufio’s sired, demonstrating his own genetic prowess. We therefore repeated the 2004 breeding with Jrufio that produced Blush (retained) & Parfait (sold as a kid) in hopes of a Junior Herdsire. We couldn’t have been more delighted when Bliss kidded with 2005 twins: one stunning jet black daughter & indeed, gave us an equally-as-fancy son that we were so hoping for! 2008 Update: We are elated w/ our Bolero kids! 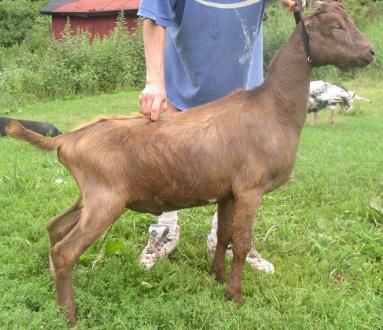 Damselfly is developing into a divine doe, looking quite similar in style to Bolero's twin sister, Blessing. She's also coming in with an extremely nice mammary . . . that looks very much like Aunt Blessing's, too - can't wait to see her fresh! 2001 Maternal sister CH Éclair: http://mystiquemeadow.tripod.com/lm/id13.html (dam of the aforementioned) has been one of our most successful does in the show-ring. Paternal sister, Lost Nation Jrufio Celeste http://hoof-and-horn.net/celeste.html was the 2005 Junior Champion at the Georgia National Fair earning her dry leg, is maturing nicely & continuing to show well as a milker. are siring very nice kids for us. Bolero’s 2006 daughter, Lost Nation Bolero Damselfly http://mystiquemeadow.tripod.com/2006does/id9.html is developing into a very stylish young lady who shows tons of promise! - We’re looking forward to using Bolero more heavily in the future!